Digital Forensics and Incident Response. All things InfoSec. Are the key_tab table values the same for all iOS devices? 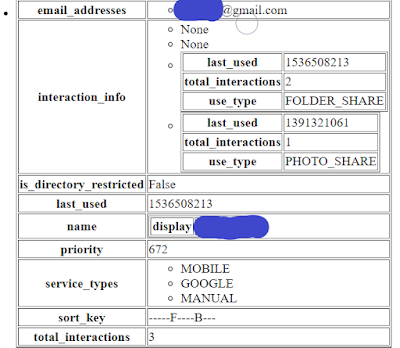 In another phone, would ID 1 still stand for compatabilityInfo and ID 13 stand for _UninstallDate data? If every phone has different key_tab relationships there would not be a way to scale this analysis using a universal SQL query for it. I'm am happy to say the community came to my rescue. Among the great multiple responses I got the ones from the awesome Sarah Edwards stand out. The fact that the uninstalledapp key is so random that it did not appear in many of the data sets from folks that reached out to me tells me that the query for unistalled apps is not useful at all, hence I nixed it. 1) The applicationState.db is a good way of getting a current list of installed apps with their corresponding app directory locations and names. It is super useful for the purposes of validating a list of installed apps that a mobile forensic tool tells you. Any app in the applicationState.db list that is not in the installed app list from the tool requires a look at that app directory. Since it is a simple SQL query it is fast and simple to implement. Sarah did not limit herself to that. She pointed me to another location rich in app installation data. 2) The MobileInstallation logs are fantastic! They have all that and more. Still, to pry a list of current installed apps and directory names out of these logs requires some work. There is no script that automates it. Time permitting I will try and take a crack at it. If the reader hasn't looked at those logs before then they (you!) definitely should. Christopher Vance chimed in with another set of forensically relevant items. Great info for future use. 3) Last but not least, Sarah provided a way to track uninstalled apps. My original requirement was to produce a list of installed apps and their corresponding app directory names and locations in order to identify any apps that would require parsing when a commercial tool misses them. As of today the applicationState.db method from my previous post seems to fulfill that requirement. If a historical look at installed apps is required the MobileInstallation logs provide a full picture. Sadly until a script is made to parse it getting that information out will require some grepping/lots-of-eyeballing-the-logs to get what is needed. For network usage Netusage and datausage analysis fills that gap. UninstalledApplications.plist rounds out the picture as the name of the plist clearly indicates. I can't thank enough all the folks who took time out of their weekends to respond and share their knowledge. Super grateful for all of you. I'm sure glad to be part of the digital forensic community. As always I can be reached on twitter @alexisbrignoni and email 4n6[at]abrignoni[dot]com. In this post I look at the applicationState.db SQLite database in detail and ask for help on testing/validating some of the findings. keeps track of app bundle IDs as well as the path and long alphanumeric folder name ID where the app keeps its data. For an example of how this looks in practice see the previous post here. As I was bouncing around some concepts with Phill Moore regarding my upcoming Magnet User Summit he asked me what would happen to the data in the applicationState.db if an app was deleted. In all my iOS third party app research I have used the database to find the app data directory names but I never thought of finding out what happened to it when an app was deleted. This post is me attempting to find out. Thanks Phill. Here we go. For an example on how to obtain a file system extraction from a jailbroken iOS device see here. Forensic workstation with Windows 10 and SSH software. Connect to jailbroken device via SSH and extract a copy of the applicationState.db file. Deleted three apps from the device. Connect again and extract a copy of the database after deletions. Compare the databases to see what changes, if any, took place after the deletions. The applicationState.db SQLite database has 3 tables of interest. The first one is the application_identifier_tab table. It contains the bundle IDs for the apps and a unique ID for each one. I have always used the ID value here to identify where the path and app data folder name in the second table of interest named kvs. Note how each value in the application_identifier column is the foreign key of the ID column values in application_identifier_tab table. For example when the value for the kvs.application_identifier filed is 110 the bundle ID name in the application_identifier_tab table is com.spotify.client. If you look back at the kvs table notice there is also a column named key. For the 110 ID there are multiple key values like 2, 9, 8 and others. What are these? These values map to the third table of interest, key_tab. Notice the blob content has the Spotify app name and the path for the application directory to include the long alphanumeric name of the folder. The blob is a binary plist that can be exported and view more cleanly with a binary plist viewer like Sanderson Forensics BPlister. What then do the other blobs contain when the key =/= 1? The key_tab table mentioned previously is the guide. It maps the values to what data it contains. If one looks at the contents of the table, value 1 stands for compatabilityInfo while 13 represents _UnistallDate. Why out of the three deleted apps one had no deletion date recorded? The applicationState.db SQLite database is super useful when one wants to list installed applications and find out which obscure alphanumeric app directory name matches an app of interest in the list. This is really important if one is to identify any apps that automated vendor tools do not parse and to locate the corresponding app data stores in the app directory. This database seems to track app deletions in some form. For some apps it will have a deletion date and for others it might not. I have yet to find out why. It is still pending to validate if the ID values for compatabilityInfo, _UnistallDate and others are the same across iOS devices. Dropbox is one of the most well known cloud storage services in the planet. It needs little to no introduction. In this post I look into what relevant digital forensic artifacts can be found for Dropbox in iOS. This post will differ from previous ones in that I will not discuss how to locate the application data directories or how to extract them. For an example on how to go about doing so follow the steps (which are for the Discord app but work for any app) here. The ability of matching app generated thumbnails on the device to the full metadata information from the original remotely stored files. Database tracking of how many times a file was viewed via the app even if the file wasn't downloaded or synced. Additional data was contained within the app directories outside of SQLite databases. If the account in use is linked to a third party provider, like Google, a JSON file is generated with all your contacts and any Dropbox interaction that took place with the target user account. Some of the data in the JSON file are names, usernames, profile pics URLs, and timestamp of the latest Dropbox interaction like the sharing of a folder. In addition the Dropbox target user account information can be found in one of these JSON files. All the queries and analysis in this blog post is provided as a guide for the reader's own testing and validation. Magnet Forensics Axiom 2.71.12070 with custom queries made by the author. Most of the databases of interest are in the /Documents and /Documents/Users/UserID directories where UserID is the numeric representation of the user account. The contents of the /Documents directory are as seen in the next image. Path: Path and filename of remotely stored file. Source: From where the activity information came from. I found no files named as such in the Dropbox app directories. Last action time: Timestamp. For files that end in .remote in the source field these timestamps match when the app was opened. For files that end in .local in the source field these timestamps match when the user had interaction last with those files. Timestamp: Time user interacted with the file last. I clicked on the thumbnails of these items in the app to view them. One of them I made available offline. The times are the same ones as contained in spotlight.db. There might be more user actions that will flag a file as local recent actions. The databases do not specify what that action was or could be. So far I have only been able to flag the files by the actions stated previously. Path: Path and filename of Dropbox stored file. Not local. Timestamp: The times in this column follow closely the time the image was taken (see next section for details.) By comparing the filenames with the timestamp column I concluded that the timestamp reflect when the image was added to Dropbox. I have my Dropbox set up to only upload images when connected to WiFi. Images taken by the mobile device camera and uploaded automatically by the Dropbox app are named in Dropbox as the creation date of the image on the device. Sample image and metadata on the device. Notice the original filename and creation timestamp. Now notice the filename Dropbox gives it after it uploads it. If the user herself uploads files and images to the Camera Uploads folder, as opposed to the app itself, these will retain their original names. Files can come from different devices and land in the same Dropbox remote storage account. These databases do not tell us what device produced or uploaded the images originally. The directory has a collection of folders named in a simple pattern of lowercase letter p followed by a number. The following image shows the contents when all three are present for the p5 folder. The obvious question becomes, how are these images matched to the items previewed, viewed, or downloaded by the user in the Spotlight database? The answer is that there is no link to the thumbnails in that database. The link is found in a different database called Dropbox.sqlite. The column named Cached File ID has the number needed in order to match the thumbnail to the full size image stored within Dropbox. It is as simple as putting a p in front of the number and looking for it in the thumbnails directory. Cached File ID: Number that corresponds to the thumbnails folder. Just add a 'p' in front of the number. Cached File Size: In bytes. File size: Actual file size. Item not local. Times viewed: How many times the user click on that thumbnail to view a larger version of it. Last time viewed: Just what it means. This is one of the most direct ways of demonstrating user activity tied to specific items. Additional databases of interest in the /Documents/Users/UserID/ directory are metadata.db, offline.db, and starred_infos_local.db. This database is interesting because the contents mirror user activity when files are browsed through the Files menu in the app. It will record folders and file names. A query was generated (Browsed files via the 'Files' menu option) to show these contents. Path: Path and filename of Dropbox stored file. Not local per testing conditions. Last Modified Date: Notice how the root folder and Dropbox generated directories (Camera Uploads, Public, etc...) do not have a Last Modified timestamp while user generated directories and uploaded files do. My testing shows that the last modification timestamp reflects when the files was placed in its current Dropbox location. By interacting with the files via the app there are no timestamp changes. Further testing is needed to see if any changes are reflected from outside the app interaction with the files in the remote storage location. Client Modified Date: Time when the file was created. Dropbox will use the file creation time at upload as the Client Modified Date. If the files are in the Camera Uploads folder and follow the naming convention discussed in a previous section, the Client Modified Date is the creation date of the image in real time as long as both values match. This might seem like a distinction with no difference but there is and it is a key one. A creation date for a file is not necessarily the same as when the image was taken in real time. Depending on where the file is in the remote storage location and how it is named one can then determine if the file creation time is the same as when the image was possibly taken in real time. Shared Folder ID: One of the folders was shared by me and another shared to me. I find no way to determine directionality by looking at the contents of the database. I want to emphasize how useful it is to understand the differences in meaning regarding Client Modified Date and Last Modified Date in the previous database. That same understanding will apply to the next database we will analyze. The next database is key because it contains metadata on a large number of images and videos uploaded to the Dropbox account no matter if the files where browsed or accessed by the user via the application on the mobile device. As stated previously this database contains information on a large number of multimedia items in the remote storage location. A query was generated (Images and videos metadata) to show the contents of the /Library/Application Support/Dropbox/alphanumeric sequence/Files/cache.db database. The explanations for the Path, Bytes (for file size), Client Modified Date, and Last Modified Date columns are the same as the ones used in the previous database, metadata.db. 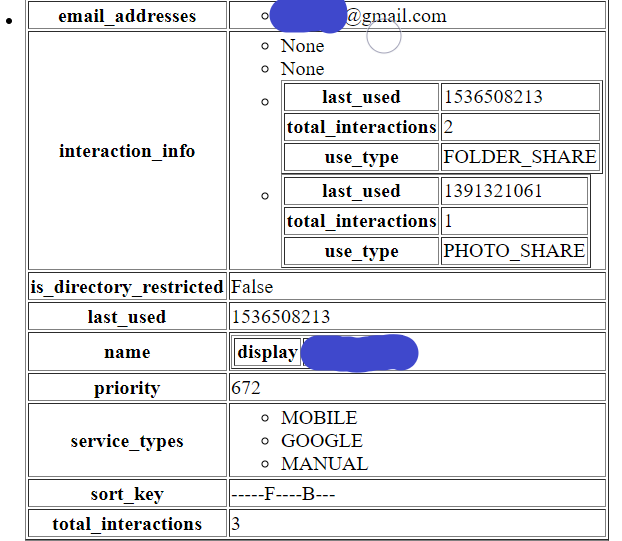 As seen in the image above some Client Modified Date data might not be moved over. If one accesses the Dropbox storage location via the web interface those dates can be seen. This means that the modified date in the web interface for the file is the Client Modified Date in the database. If file is in the Camera Uploads folder, and it is date timestamp named, and the Client Modified Date is equal to the date timestamp name then the Client Modified date IS the time the picture was taken via a mobile device camera and would reflect the time given by such device. All conditions are necessary for this assumption to be true based on my testing. 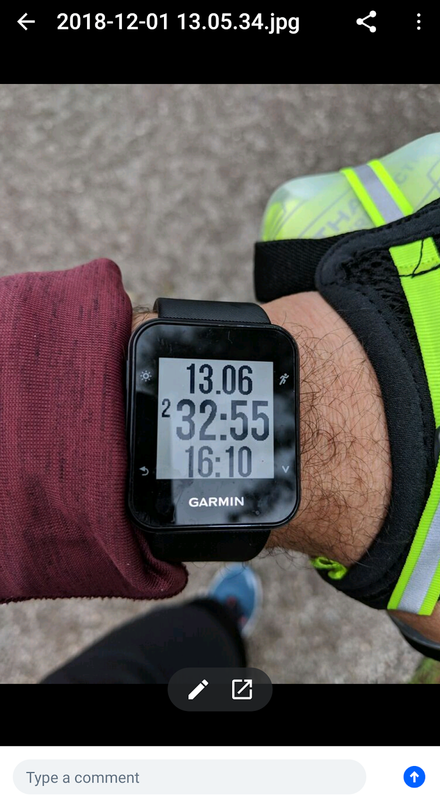 The underlined word in the last sentence is important because it assumes the mobile device that generated the image or video is keeping time accurately in relation to real time. It is true that science doesn't work in assumptions but it is guided and informed by them. Always do your own tests on your own particular case scenario. For all other files the Client Modified Date is the creation date of the file without any assumptions on when the picture or video was taken in real time. Last Modified Date is when the files were uploaded to remote storage absent some yet unknown mechanism that affects this timestamp after file upload. When multiple files are selected for download a zipped files is downloaded to the system containing the selected items. After decompression the files created and accessed times are the same as the Client Modified Date in the database. If you download a single file all modified, accessed and created times will be the same and will reflect the moment the file was downloaded from cloud storage locally. The file properties on the left are from a zipped file whereas the file properties on the right are from a single file download. Both done via Chrome browser on Windows 10. Here are the values for the same file as recorded in the database. The difference in hours and minutes is due to setting the time values in the database viewer (Axiom) to UTC-5:00. Notice how time recorded in the database is exactly the same as the created and accessed dates in the unzipped files. Database records items selected for offline viewing. A query was generated (Files available offline) to show the contents. The database is located in the /Documents/Users/UserID/ directory. Database records starred items. A query was generated (Starred files) to show the contents. The database is located in the /Documents/Users/UserID/ directory. Database records user notifications. 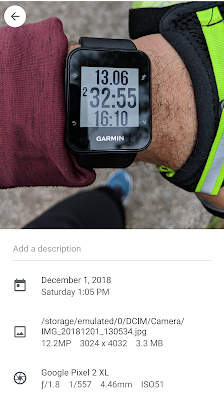 A query was generated (User notifications) to show the contents. The database is located in the /Library/Application Support/Dropbox/Alphanumeric string/notifications directory. Notice the feed timestamp on the left as well as the content of the notification in JSON format. Since the JSON notifications in the database did not follow a consistent key:value pair pattern they are presented as is. They are small enough for any examiner to read and figure out what they are about. Dropbox keeps data in JSON files in addition to SQLite databases. The following two files are of great interest. They are located in the /Library/Application Support/Dropbox/Alphanumeric string/Account/contact_cache directory. Here is a sample contact from the list. Is_me field with a value of True. Due to now being able to obtain file system extractions from devices we couldn't in the past it is important we revisit our analysis of what we might think are already well known applications. This is even more relevant when the data we are examining is multi-platform and sometimes we might have to look at it from different vantage points, for example mobile device data in contrast to the same data viewed through a desktop browser. The eternal caveat still applies. Always test, test and test. And when done, test some more.